Earlier this year, Star Wars™: Galaxy of Heroes introduced the very first Hero’s Journey event, featuring Luke Skywalker as he first appeared on Tatooine in Star Wars™: A New Hope. Players could experience iconic events from the film and eventually unlock the next evolution of his character, Commander Luke Skywalker. It wasn’t a long time ago that we were introduced to Rey in Star Wars™: The Force Awakens. On the desert planet of Jakku, a series of events set into motion a journey that would change her life forever. Coming soon to Star Wars™: Galaxy of Heroes, you’ll be able to live Rey’s adventures through the Hero’s Journey special event. Experience some of her most thrilling moments as she progresses from a humble scavenger to making new allies to finding the legendary Luke Skywalker. Complete the event to unlock the next evolution of Rey and add her to your collection. To participate, players will need the scavenger version of Rey, currently available in the game. You can look forward to playing as Rey (Scavenger) in her Hero’s Journey event, in support of the worldwide theatrical release of Star Wars™: The Last Jedi this December. Star Wars: Galaxy of Heroes players on Android that are looking to unlock or upgrade Rey (Scavenger) can do so now by purchasing Google Play gift cards available at retail locations around the world and online HERE. 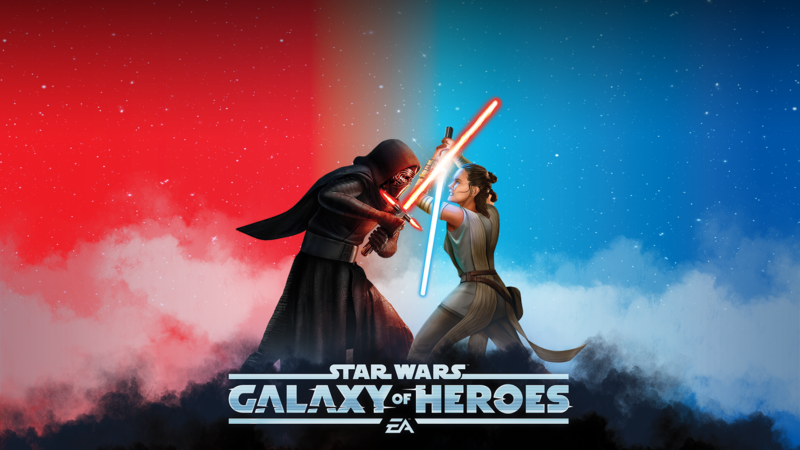 Each Star Wars: Galaxy of Heroes account can redeem this offer up to three times. NOTE-We're creating a permanent page with further details and a list of which retailers are active in each country. Please check back soon! We look forward to seeing you on the Holotable! In the above post, we mentioned that we’ve partnered with Google to offer a special in-game bonus to Star Wars™: Galaxy of Heroes players who purchase a Google Play gift card in select countries for a limited time this holiday season. There’s been some confusion on the offer details and availability by country and retailer, so we're providing Google’s official retailer list and schedule below. This list is subject to change and please contact Google if you have any specific questions related to the list or your particular purchase. "List updated on 11/7 to reflect latest retail info." The offer varies by territory, but in most countries, there are 3 different reward tiers which depending on the value of gift cards offered in that country and the reward is Rey (Scavenger) of varying star level plus some crystals. Please refer to the signage at physical retailers or the Terms and Conditions found on the product page for online offers for the specific rewards in your country. Is this only available from physical retail locations? Can I purchase this offer online? 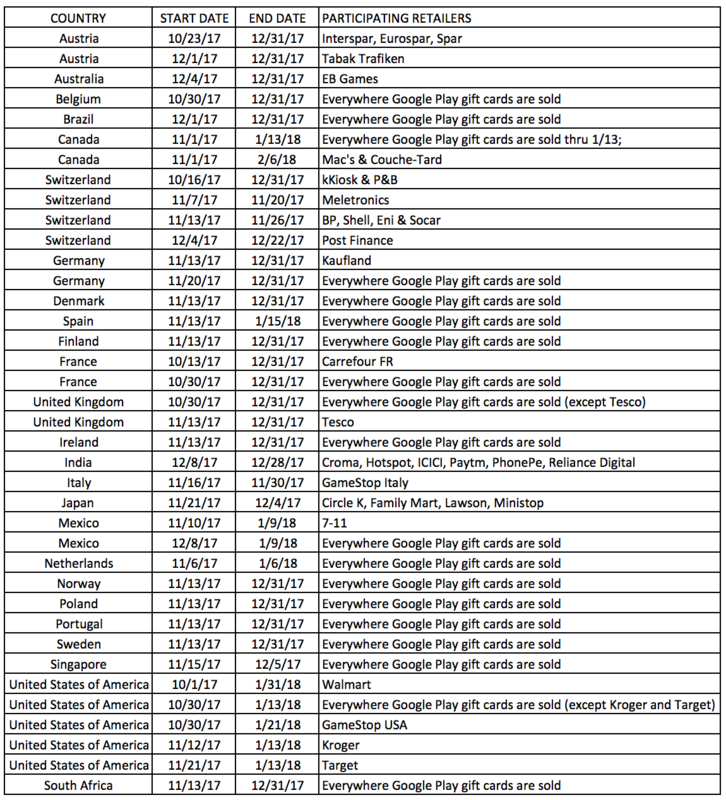 You can purchase Google Play gift cards from participating physical retailers or purchase from many retailers online (see Google’s official list and refer to the signage at physical retailers or the Terms and Conditions found on the product page for online offers). I bought a gift card, how do I claim the reward? Most importantly, make sure you’re logged into the same account on your Android device AND inside Star Wars™: Galaxy of Heroes. Open the Menu and tap Redeem. Enter your gift card code. Tap Add Item on the Star Wars™: Galaxy of Heroes pop-up. Tap on Open when instructed by your device. When the game opens, you’ll see a text pop-up confirming that you redeemed your code. You’ll also receive a message in your game inbox that confirms you’ve received the reward and Rey will be in your Characters area, ready for you to activate. What can I do if I’ve already purchased a Gift Card from Target or Kroger? The promotion is running nationwide in the US as of October 30th with the exception of Kroger and Target stores. Kroger is scheduled to launch as of November 12th and Target as of November 21st. We apologize for the miscommunication and are working with Google. If you have one of these cards, then please contact us via EA Help. This can be done by tapping 'Help' via the Settings menu in your game. Please be ready to provide 1) proof of purchase for card (digital or physical), 2) card code, 3) email receipt for redemption of promo, and 4) ally code or player ID. I was supposed to receive a 7* Rey, but I only got a 4*. What should I do? Rey unlocks at 4*. If your reward was for a higher star version of Rey, we’ve also given you the additional character shards and credits needed to promote her up to that star level. Go to your Character Selection screen, find Rey and tap the PROMOTE button in the bottom right to increase her star level. I already had Rey at 7*. What am I supposed to do with these extra shards? Excess character shards can be converted to Shard Shop currency which can be used to purchase character shards or gear. I redeemed my code, but Rey hasn’t shown up in-game. What should I do? Ensure that you’re logged into the same account on both your device and in-game. Double-check to ensure your retailer is participating (see the official list above). If your retailer is not participating, you may not get the reward. I purchased a gift card from a retailer online, but I haven’t received my code. What can I do? Many retailers deliver the online gift card purchases to you via email after a brief delay (sometimes up to 4 hours). Please refer to information on the retailer website, purchase confirmation or other email regarding how long to expect between purchase and delivery. Contact your retailer if you continue to have issues. How many times can I purchase this offer? Most countries have 3 different offers tiers available. You can purchase each tier a maximum of 3 times. Refer to the in-store signage or Terms and Conditions for online offers in your specific country. Can I move my reward to another account? No, the reward is tied to the account at the point you redeemed the offer.